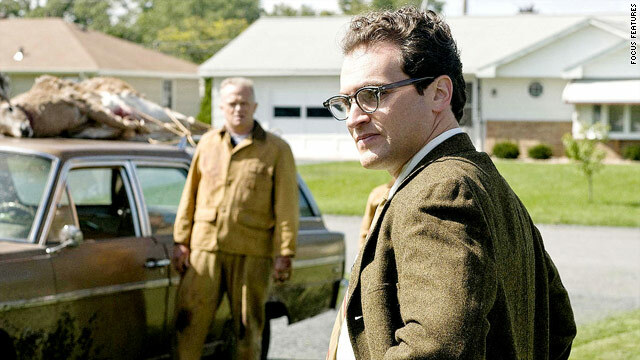 The Coen brothers' "A Serious Man" topped Tom Charity's list of 2009's best films. Also in top 10: "Ponyo," "Inglourious Basterds," "Hurt Locker"
(CNN) -- Over the past week, "Avatar" and "Sherlock Holmes" sealed another record-breaking box-office year for Hollywood, with a little help from a trio of singing chipmunks. Not so fast. Blockbusters are attracting huge audiences, but size doesn't come cheap, and this year -- like last year -- the studios continued to cut back on the middle ground: the low- to mid-budget films that are rarely enormously profitable but that have nevertheless formed the bedrock of America's love affair with movies for the best part of the last century. In a society proud to place a high value on independence, movie culture seems increasingly stratified and programmatic. Moviegoing is no longer habitual for most adults; the gamers who flock to "Transformers: Revenge of the Fallen" -- the biggest grosser of the year in more ways than one -- are impatient with character and nuance, and are simply looking for maximum bang. So long as Hollywood keeps upping the ante, audiences will repay the compliment. But sooner or later, something's got to give. If film production costs keep escalating, it will be the audience who pays, not only in higher ticket prices, but in reduced choice. "Avatar" deserves to be a hit, but I have a strong suspicion that in setting out to save cinema, James Cameron has only made things worse. If the housing market bubble can burst, so can the blockbuster business. "Avatar" didn't make my top 10, though I liked it well enough and much better than most in what was, by and large, a dismal year for Hollywood movies. There were a few bright spots: J.J. Abrams reinvigorated the "Star Trek" franchise ... Pixar ("Up") and Disney ("The Princess and the Frog") contributed to a banner year for animated films ... there were adventurous commercial films from Steven Soderbergh ("The Informant! "), Spike Jonze ("Where the Wild Things Are") and Michael Mann ("Public Enemies") ... and Francis Coppola returned with his unapologetically esoteric and personal "Tetro." The year will also be remembered as a watershed year for female filmmakers: Kathryn Bigelow, Jane Campion, Nora Ephron, Nancy Meyers, Rebecca Miller, Christine Jeffs, Anne Fletcher, Mira Nair, Karyn Kusama, Lone Scherfig, Lynn Shelton and Drew Barrymore, for starters. (And that's ignoring the French: Agnes Varda, Claire Denis and Anne Fontaine all had films on the arthouse circuit in recent months.) Of course, not all these films were hits, but the success of female-driven movies such as "The Twilight Saga: New Moon," "Julie & Julia" and anything at all to do with Sandra Bullock should put an end to that old Hollywood canard that those movies don't open. It's bizarre that the Coens' best movie in a decade isn't getting the respect (or the audiences) it deserves. On the surface, "A Serious Man" seems to be a modest venture -- it doesn't feature any stars, and it appears to be a relatively banal story about a physics professor, Larry (Michael Stuhlbarg), barely coping with the news that his wife is leaving him just as a work promotion hangs in the balance. Yet from these domestic tribulations, the Coens have fashioned a movie that is, on the one hand, a probing examination of mortality, faith and guilt; and on the other, a bitingly acidic black comedy about middle-American Jewish mores in the late 1960s. There may never have been a better vintage for animated feature films. Three made my top 10, and two more came close. The best came from Japan: Hayao Miyazaki ("Spirited Away") has long been held in high esteem in America, though he's never had a box office hit here. "Ponyo" is a strange and beguiling fantasy film about a sea spirit. It's an odd eco-fable, but illustrated with such beauty and imagination, it transports entirely into another world. Quentin Tarantino's outrageous and brilliant war movie is the ultimate in revisionism. For 2½ hours in the dark, the cinema is everywhere and everything. Eclipsed in the zeitgeist by lead actor Joaquin Phoenix's mysterious behavior on Letterman, this is probably the most underrated movie of the year, not least for the actor's consummate portrait of a man desperately in love with the wrong girl (Gwyneth Paltrow). This was supposed to be the year of 3D, and with the arrival of "Avatar," I suppose it was. But nobody used the third dimension more creatively than Henry Selick in this dark and disturbing animated feature about a young girl momentarily tempted by a glimpse of an idyllic other life. Lucrecia Martel's Argentine enigma spoke volumes while spelling out nothing. Martel demands attention; she may be the finest filmmaker on the continent. The best-reviewed American movie of the year is an intense, unflinching suspense film about a bomb disposal expert in Iraq (a career-making performance from Jeremy Renner). Why did it bottom out at $13 million at the box office? The distressing scene in which Renner cut into the corpse of a booby-trapped dead child may have had something to do with it. That kind of courage is rare in movies, but there's a smaller market for honesty. Another box office under-achiever, Jane Campion's most assured film in a long time deserves to find a wider audience on DVD. The story of John Keats and love of his life Fanny Brawne, this is a sensual, immersive, deeply passionate movie. I enjoyed "Up in the Air," too, but if I had to pick one George Clooney movie this year, it would have to be this. Taking Roald Dahl's story as a starting point, Wes Anderson reconceived the reckless red fox as another of his irresistible, incorrigible and tragically immature alpha males. Mr. Fox's bravado has potentially terrible ramifications for his family and friends, as he ruefully comes to admit, yet this is his nature, and he cannot be otherwise. The same is true of Anderson, yet the switch to stop-motion has inspired his most visually lovely film and freed up his comic imagination. 10. "La Danse: The Paris Opera Ballet"
Veteran documentarian Fred Wiseman trains his camera on the rehearsals and inner workings of the venerable Parisian ballet company for 2½ hours -- roughly the time it took for Michael Bay to destroy one of the seven wonders of the world. Movie audiences thrill to destruction, but the art of creation can also be enthralling. 7. "Transformers: Revenge of the Fallen"
6. "The Time Traveler's Wife"
5. "Ghosts of Girlfriends Past"